Puget Sound is in trouble. Pollution, development, and habitat loss have contributed to immense devastation of the Puget Sound ecosystem. But only 37% of area residents were even aware that there’s a problem. And only a tiny fraction of these people were actually taking action in their lives to help fix the problem. The Alliance for Puget Sound Shorelines, an historic partnership between three major environmental groups, wanted to initiate a public engagement campaign to lead and support their massive-scale restoration and conservation effort. But engaging the public around environmental causes is not an easy task. People have heard the same sorts of earnest environmental messages conveyed in the same straightforward way for decades, and appeals to “doing the right thing” will only activate a small segment of the population. In order to create public support for APSS’s initiative, a new approach was needed. 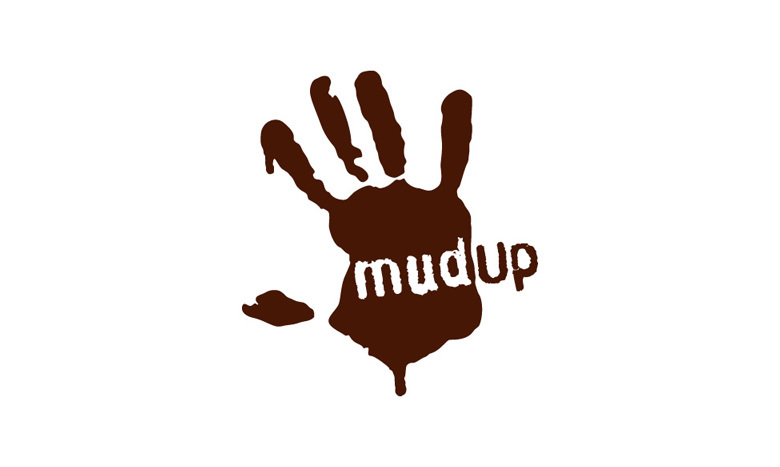 MudUp is a different approach to engaging the public in volunteer efforts around the environment. MudUp is about the spirit of play. It’s about hands-on experience. It’s about fun and excitement. With the research in mind, we designed a campaign that engages people’s emotions at every level. Every campaign element — from viral and grassroots efforts, to the digital and social media strategies, to strategically-placed paid media — has been designed to appeal to people in a visceral way. 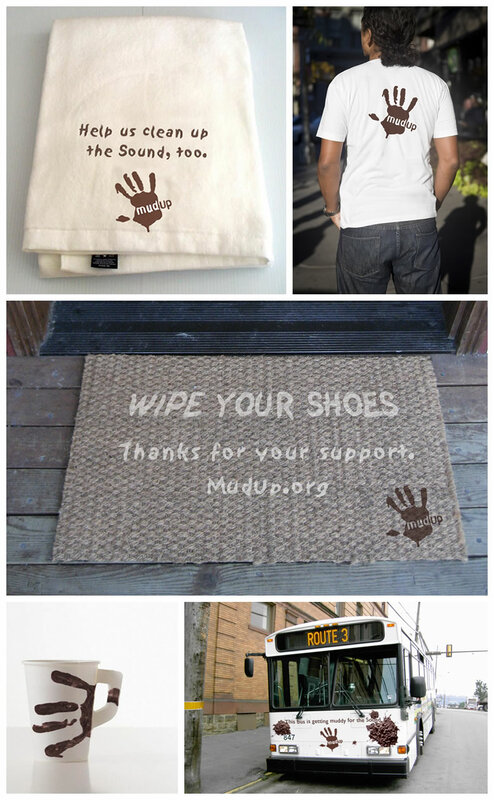 The MudUp campaign breaks through the traditional model of asking people to volunteer because it’s “the right thing to do.” MudUp goes deeper and taps into people’s emotions, and appeals to the inner child in all of us that simply delights in playing in the mud. The bold campaign mark uses an emblematic, muddy human handprint as a messy but prideful mark, symbolizing the deep human connection with, and commitment to, our local surroundings and sense of place. Every component of the MudUp campaign is designed to address one key question: What will get people off their couches and into action? The MudUp campaign is very action-oriented, and uses a number of different tactics to incite people to actually do something. 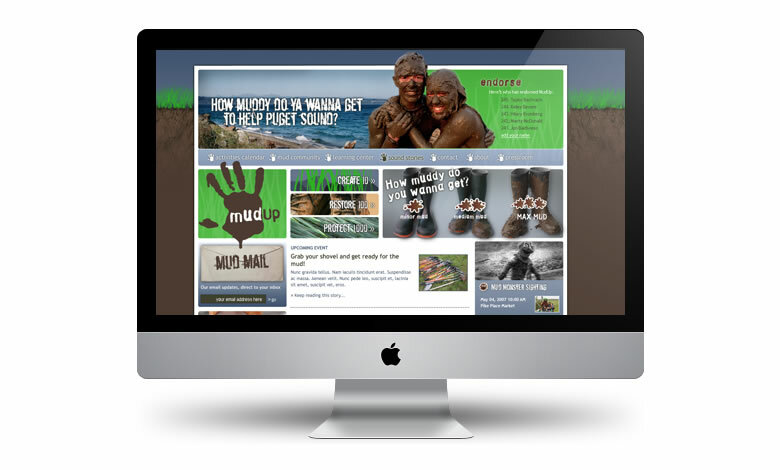 Besides all of the key hard-working elements of the campaign, from influencer events to digital strategies and strategically-placed paid media, we devised certain “surprise and delight” elements to really force the "Mud Movement" into the conversation. 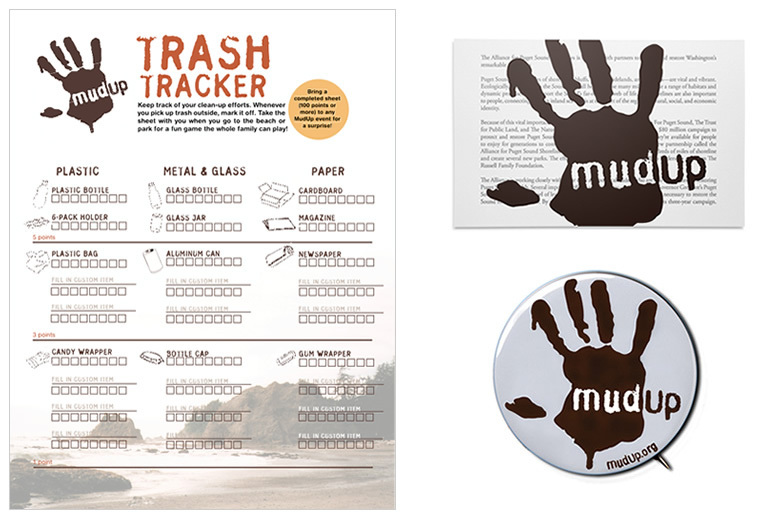 Items were designed for maximum conceptual brand impact, from branded mats and towels for clean-up after muddy work, to bold branded direct mail and collateral. 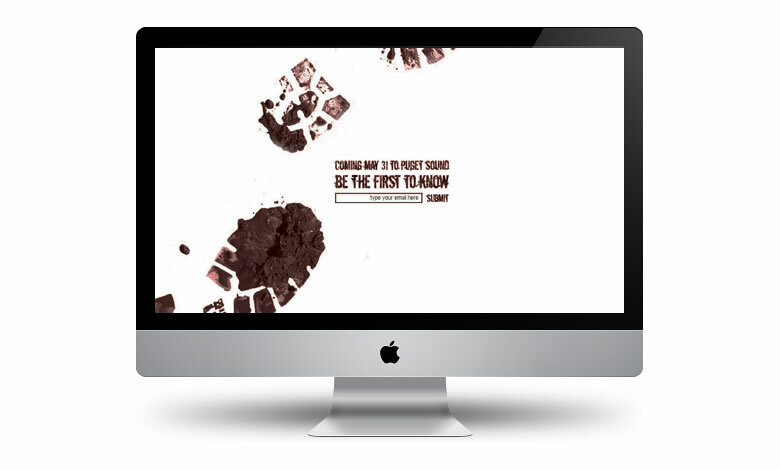 We began with a teaser site to capture curiosity seekers’ emails generated from an orchestrated grassroots outreach effort that drove early buzz. This early outreach strategy was directed at our core audience, whose influencer status was key in getting some preliminary critical mass. Upon launch, the campaign’s engine was housed in a robust, social-enabled CMS website, allowing for ease of content access and management across the numerous orgs. 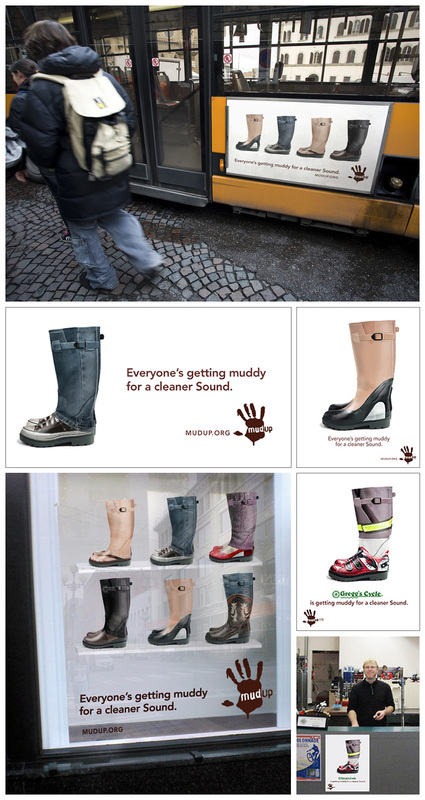 The site was designed as a clearinghouse where people could go for a calendar of activities and events all around the Sound, based on varying degrees of how muddy someone wanted to get. And it had to be highly playful and engaging, with features like the campaign mascot’s “Mud Monster Sightings,” an online forum to “Ask The Mud Monster,” and interactive activities for kids, all of which allow people to interact with the campaign in an unexpected way. The popular social-enabled, interactive forum serves as a place where people can share their own Sound-related stories and photographs. Following an early-phase grassroots outreach effort, which was designed to stay true to the campaign’s grassroots intent, we began a broader region-wide awareness campaign through paid media, which included television, transit, outdoor, radio, print and digital. 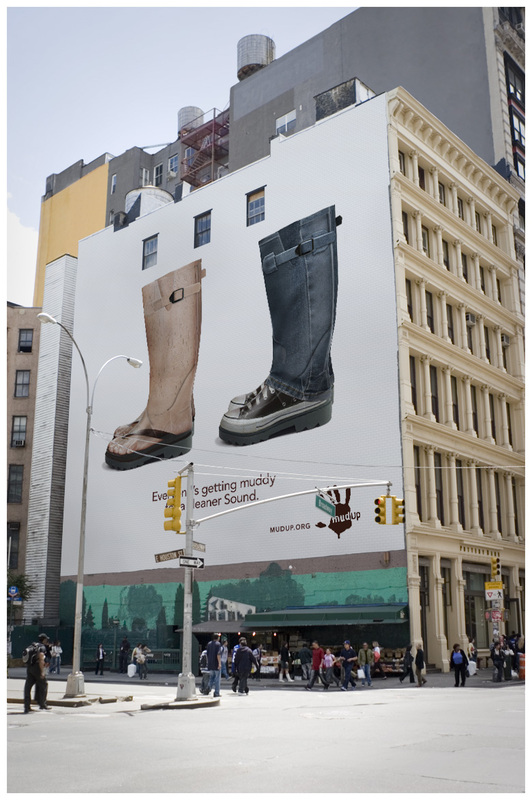 The iconic “wellington boot” was conceived as a breakthrough mnemonic to cue engagement around the cause, and we placed it into unconventional situations both for maximum impact and to build a sense of community around the effort. As an extension of the popular boot mnemonic, we then took it to a higher level by concocting a series of visually arresting “trompe l’oeil” painted boots reflecting the sense of diversity and community participation. 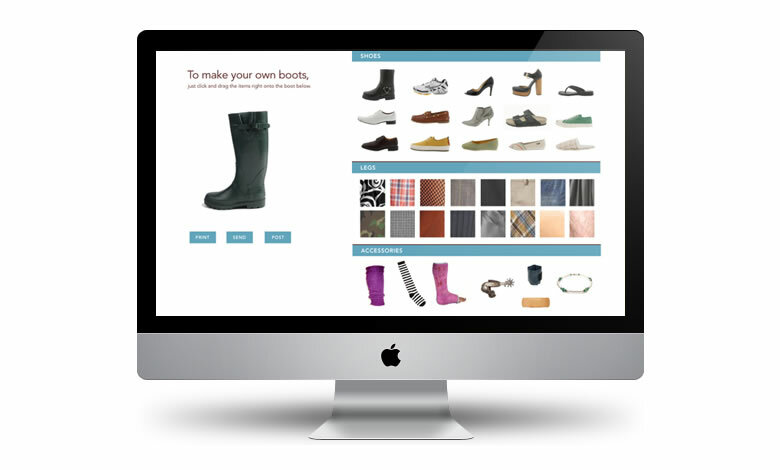 “Build a boot” is a digital, interactive art-project customization game where you design the boot that’s just right for you, and then share it on your social networks. The same idea extends into a coloring book project that gets kids involved at various events around the Sound. 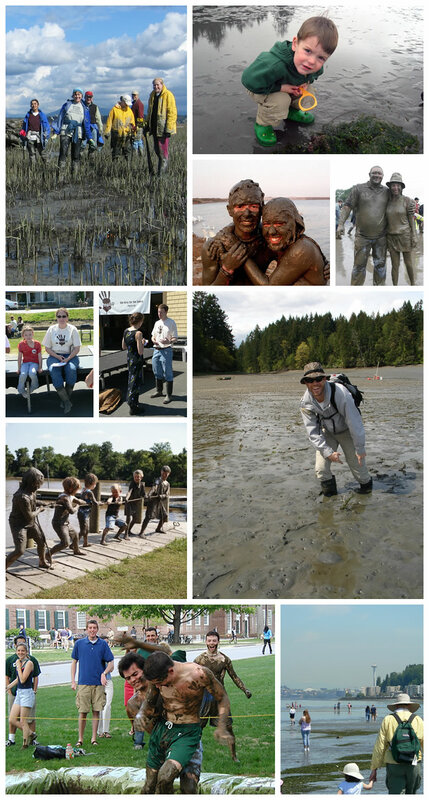 While the hard work was done by the thousands of people who came out all over Puget Sound to participate in staged clean-up efforts, there was still much muddy fun to be had by all, making the overall experience a good and memorable one. 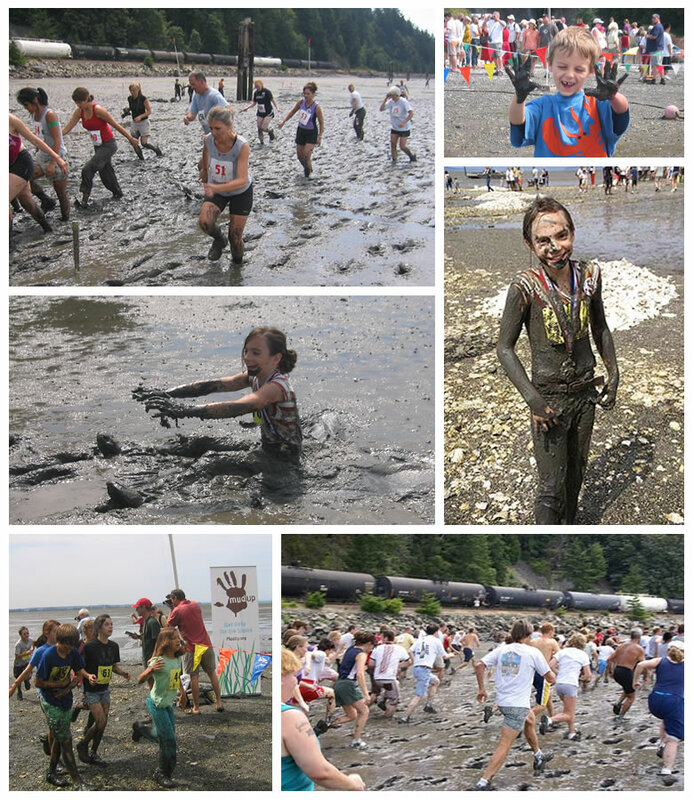 The capstone annual event was the combined Bivalve Bash and Mud Run, held on an expansive coastal oyster bed during low tide in summer, and featuring heats for all different age groups, lots of barbecued oysters, beer, and, of course, mud. Plenty of mud. A highly participatory experience was key in drawing people into our booth at events around the Sound. We incorporated fun tactics like personal signature boot prints to go on the community wall that then entered people into a competition to win prizes. Educational collateral, posters and signage helped the “adults” engage in the issues. Last but not least, and perhaps most important of all, was the MudUp mascot—the Mud Monster. MM as “he” came to be known, was sent to crowded locations all around the Sound to spread the word about the campaign. This was a way of bringing the campaign to life in a personal and emotional way from people’s very first point of contact — mascots/monsters exude a magnetic energy that taps directly into the subconscious. 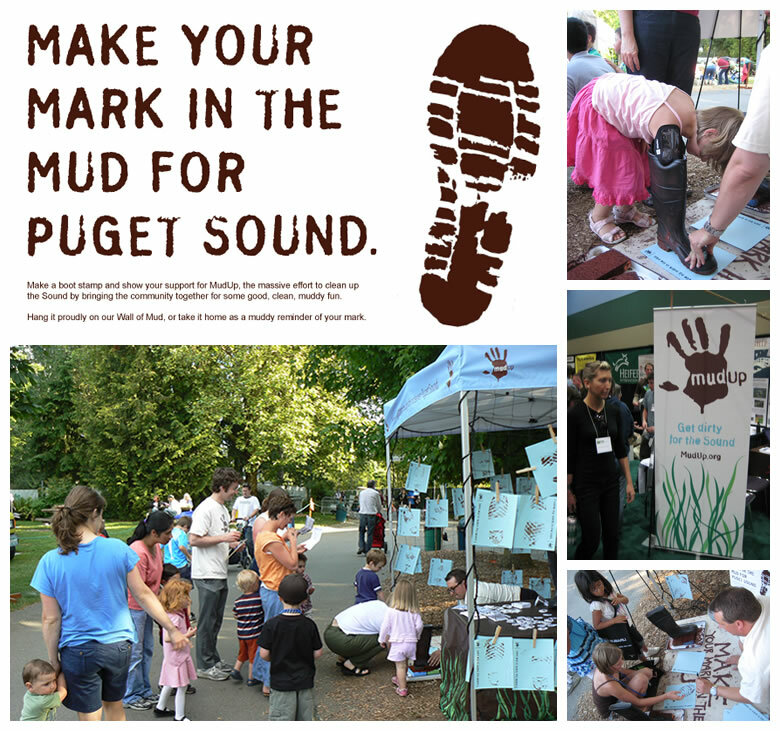 The Mud Monster and Mud Buddy made public appearances at Town Hall lectures, at farmer’s markets, at Storm games (Seattle’s basketball team), at serious Sound-related government events, and at enormous festivals like Folklife. They also went into day camps and community centers to talk more in depth about the Sound’s problems. The Mud Monster and Mud Buddy were often preceded by a group of mud-covered people carrying “LOST” posters and asking the crowds if they had seen the Mud Monster anywhere. People were encouraged to text message a photo of the monster to the mudup.org website, if they did happen to see him.